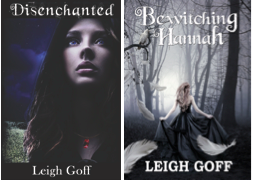 Leigh Goff is a writer inspired by classic tales and star-crossed fates. Be sure to visit her Books page for more information on her writing and click the “Subscribe” button to receive e-mails, updates, and upcoming cover reveals. Available Now— from Mirror World Publishing, BEWITCHING HANNAH. In Leigh Goff’s newest young adult novel, which provides an enchanting twist on the Beauty-and-Beast theme, you will meet sixteen-year-old Hannah who can no longer afford to suppress the magic that has taken away so much. Engaged in a deadly game of fate and not knowing whom her true rival is, she isn’t certain she’ll survive, and if she loses, she may lose everything including the mysteriously scarred, star-crossed boy she loves. For a signed copy from the author, click here and an unsigned copy from Amazon or B&N. Also available–Her debut young adult novel, DISENCHANTED, a delightful, spellbinding story that reimagines the legacy of a historic Wethersfield witch in the present-day life of her sixteen-year-old descendant. You can purchase a signed copy from the author here and an unsigned copy from Amazon or B&N.